And substantiated by the greatest theologian of the Church, no less. Pope Benedict XV declared: "The Church has declared Thomas' doctrines to be her own." And aren't these doctrines of the "Immaculate Heart" and the "Sacred Heart" based on yet more "private revelation" which supposedly Roman Catholics are not "obliged" to believe? Oh for Pete's sake, we venerate the Immaculate Heart of Mary because, in classical thought, the heart was the essence of the person. It would be a bit like saying we love the Blessed Mother's soul. We would not literally mean we love her soul to the exclusion of the rest of her. I think if anyone but the Catholic Church had such a devotion people would not pick over it as they do. the last making me shudder at the thought of development of doctrine like the immaculate heart ever latching onto the virginity of the Holy Theotokos. they have a big festival in June celebrating the earth (Kali is a Earth mother goddess)'s menstruation. I find Sacred Heart devotions to be foreign and I don't really understand them. However, other than being quite inflammatory, I fail to see how posting pictures of Mayan or Hindu pagan rites can make debate points on these issues that would do anything to cause one to rethink one's position. The Puritans made the same type of arguments about celebrating Christmas and its origins. How about assuring us that a saint's visions are demonic? How is that for civil? Where is the post that I sent along with this one reminding everyone that nowhere in the Roman rite and ritual do they ask the Mother of God to save them. So it is not at all clear that the Roman rite and ritual are any more "dangerous" than Orthodox rites and rituals. Is it orthodox to show the Heavenly Father (A spirit) on an icon? To depict him who none but the Son have direct knowledge of? Definitely not as a rule of thumb, but that icon is definitely special. Yes. The Orthoodx have been painting such icons, in all Orthoodx countries and for many many centuries. Some people wrote against it but the Church at large accepts it. A seach of the forum using Ancient of Days will turn up earlier threads on this. Such depictions of God the Father have the approval of the holy Mother of God and that is good enough for me! 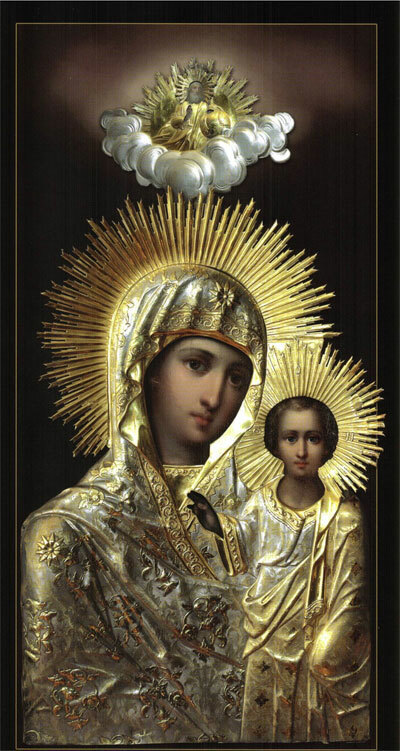 When Russia collapsed in 1917 the Mother of God gave to the Russian people an icon of "The Reigning Mother of ofGod." She wanted to comfort and strengthen believers in the ferocious persecution which was about to be launched against them, something she knew but they did not. /\ Absolutely what ozgeorge said, even down to the very queasy feeling about depicting her with the wounds of Christ. One of the things she said was that it was not just Christ who saved us, but the Mother of God who saved us as well. She made it sound as if the Mother of God was as much our savior as Christ. Among other things, she said that it was "Mary's blood" that saved us, because Christ got His blood from her. She made it sound like it was actually St. Mary's blood that was in Christ veins, and that therefore it can be said that "Mary's blood" saved us. She brought up the creation narrative in the Book of Genesis and said that when God created Adam, He used a plural pronoun for Adam. She said the meaning behind this was that God was creating both men and women, and that therefore both a male and female saviour would be needed to save all of humanity. In other words, one male saviour would not have been enough; we also needed a female saviour, who was the Virgin Mary. She also brought up the Wedding of Cana, and used that to say that the Mother of God could change her Son's will. It seems we've gotten sidetracked into other tangents, such as the sacred heart, or immaculate heart, as well as some rather shocking things I wish I never learned about Hindu deities, and other things. It's all very interesting, but like you said, it may not relate to what I asked about. Vassula and her followers are savvy enough to realize that most Orthodox and Catholics are ignorant of their own religious faith; There appear to be thousands of female Catholic Saints who were canonized due to believing in the Precious Blood of Christ and/or the Sacred/Immaculate Heart of Mary and/or Christ. This is nonsense. Complete nonsense. Saints are recognized by the Church first and foremost by their exercise of heroic virtue. If that is not there then it doesn't matter what else they said or did in life. There is nothing in the idea of the Virgin being co-redeemer that indicates that she was not redeemed. In fact in the very course of her redemption, she, unlike the rest of us, brought forth the New Adam, Jesus, Redeemer, King. It is in that way and ONLY that way, by her faith and her cooperation and her suffering, that she is said to be co-redeemer...and it is NO different from the Orthodox asking her to save them. Her suffering did not redeem us...no matter how many times you say it. and it is NO different from the Orthodox asking her to save them. We don't believe the suffering of the Theotokos saved us. Christ's Incarnation Life and Death saved us and her. She saves us the same way all the Saints save us- by praying for us and guiding us to Christ. That is why the in the Hodegetria Icon she points to her Son. We even ask our Guardian Angel to save us every night at Compline ("take me by my wretched and outstretched hand and lead me in the way of Salvation"). THAT'S how the Theotokos saves us- not through her suffering as you heretically believe. "Again, we offer this spiritual worship for those who repose in the faith, forefathers, fathers, patriarchs, prophets, apostles, preachers, evangelists, martyrs, confessors, ascetics, and for every righteous spirit made perfect in faith, especially for our most holy, pure, blessed, and glorious Lady, the Theotokos and ever Virgin Mary." You see? In Orthodoxy, even she who is "more honourable than the Cherubim and more glorious than the Seraphim", the most Holy Theotokos, must have the Sacrifice of the Eucharist offered for her. Even she must be washed in the Blood of Christ. It's therefore not only heretical, but a blasphemy both against her and her Son to say that her suffering redeemed us. ^ The stuff written in the above sites does sound an awful lot like what I heard. None of what you are looking at can be approved as Catholic UNLESS one understands that all that is said about the Mother of God points to Jesus, Lord, Redeemer, King. Most of what you look at anywhere is the same thing you find in patristics with the New Adam and the New Eve. That is the reference point through which all of this is understood. If salvation comes into the world through the Mother of God, you don't say "Oh oh oh!! The Mother of God is our Redeemer!! "....You say "Yes! The Son of God came into the world through the Virgin and took her flesh and is fully God and fully human!!" Catholics do not believe that the suffering of the Mother of God saved us at all. 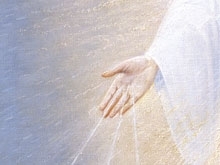 We do believe that ALL of us, by our cooperation in the divine life...by theosis...participate in some way in the redeeming act of the Savior. IN that way we are all co-redeemers, and the Mother of God is more so than any of the rest of us because her fiat was perfect and we are works in progress. These things are not incompatible with Orthodoxy. And this is ALL that is meant by the Church IF they ever truly speak of any of us cooperating in the redemptive acts of Christ. You can crow all you like but it won't make your assessment truthful. You are wrong and egregiously so. God help you. Bravo! In a few lines you manage to misrepresent both Orthodoxy and the Vatican. LOL. Rather your "explainers" want to deny in words what their actions say. And btw, may I officially state that the Orthodox have never believed in the "Co-Redemptrix." Just so when the Vatican makes it a dogma (and its coming, your defense of that shows it), there's a record to point to when it claims (like with the IC) that we believed it until the supreme pontiff proclaimed it. The dogmatic proclamation may indeed come, but I still do not see Pope Benedict doing so. Yeah, that's not too disturbing. (De Vrouwe van alle Volkeren is "The Lady of All Nations"). "Her hands have radiant Wounds. Thereby Mary describes in an image the suffering of body and soul which she bore in union with her divine Son for the redemption of mankind." I can't believe I missed this. You should post this in the thread about God the Father icons. Again, you should discuss this in the appropriate thread....and when I find it, I'll post the link here. They've never used the words but Orthodoxy has taught over time that we all share in the saving actions of Christ. That our suffering is a part of the saving act. It is in this sense that the Catholic Church also understands the teaching of co-redeemer. All your assertions are wrong. Simply and purposefully wrong. They are not mutually exclusive. The Church east and west has always indicated that by our fiat we cooperate in the redeeming acts of Christ. It is in this way that the Mother of God is seen to be co-operating. But I don't believe Mary suffered and died on the cross. Now you are misrepresenting what I said. Also, when did I do an ad hominem? Wow...someone actually using some logic. Thank you. That holy card or whatever it is that is being displayed here is unusual. The only other kind of image that shows wounds on the body of the Mother of God is the one that displays the swords in her chest. I think you may have the same image. Personally I dislike that one and am not moved by it in any form, east or west. May The Lady of All Nations, who once was Mary, be our advocate. Amen." "no theological or psychological impediments for a declaration of supernatural authenticity can be found therein." In 2005 however, on May 20th, less than 2 weeks after Cardinal Ratzinger, was elected Pope, the Congregation for the Doctrine of Faith issued a statement banning the words "who once was Mary" from the prayer. "......MAY THE LADY OF ALL NATIONS, THE BLESSED VIRGIN MARY, BE OUR ADVOCATE. AMEN." So, apparently, a "private revelation" approved after consultation with the Congregation for the Doctrine of Faith was later "amended" by the same CDF to meet its requirements a fortnight after the Prefect of the CDF was elected Pope. Strange that rather than condemning the "apparitions" as containing erroneous "revelations", the CDF was satisfied with merely changing the content of the revelations. Amen. What a blasphemy which compromises the souls of people to say that the Virgin cooperated with salvation. Almost as bad as saying the Church was built on Peter instead of Christ and that there is a so called vicar of Christ on earth.